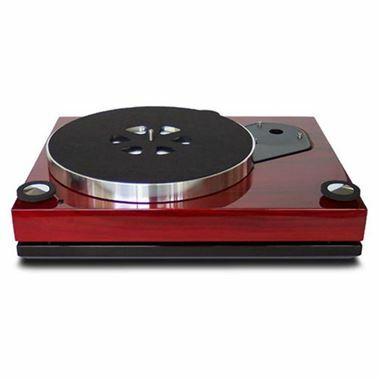 Roksan Xerxes 20+ Turntable Chassis Only. Available with Online Finance and Free Delivery. The Roksan Xerxes 20 Plus is the result of over 20 years of research and development and refinement of the Xerxes.20 based on Roksan's most advanced record player, the TMS 3. The elegance in engineering is visible through the compact clean lines and robust construction of the Xerxes 20 plus's three plinths and triple layer isolation system. The hardened tool steel spindle, the tungsten carbide ball and the two-piece solid phosphor bronze housing, which is machined to an accuracy of 5 microns, provide the unique self centering, self aligning true single point main bearing. The arm board/cut-out (which solves the inherent problems of a sprung sub-chassis and mass loaded designs) is isolated and removable improving performance and aiding set up with minimal maintenance. The top plinth prevents any residual moror vibration from reaching the record/cartridge interface. The sub-plinth which supports the main bearing/platter assembly and the tonearm, decouples the stylus/groove interface and isolates it from external disturbances. The detachable armboard machined from a billet of acetal provides a further level of isolation with complimentary coupling between the tonearm and the sub-plinth. The Xerxes 20+ can be fitted with any of Roksan's tonearms or any other high quality arm to offer a powerful and expansive sound displaying a fine midband, a fast and deep bass and a very smooth and open treble. Musicians are firmly located within the soundstage, with the tempo and musicality combined to create a compelling sense of live music being played. Utilised in the Xerxes.20plus are TMS 3's main Bearing Ball, Inner and Outer Platter design that are refined to ensure the record remains almost undisturbed by the internally induced vibrations. This provides the cartridge with an almost silent passage to retrieve the vital audio information. The combination of the Plinth material, density, linear damping, vibration absorbing weight blocks, lowered decoupling frequency and controlled harmonic structure delivers a performance second to none. Can be fitted to TMS, Xerxes10, and the new upgrade plinths (replaces the spikes).